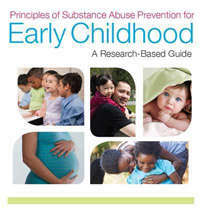 Infancy, toddlerhood, and the first years of school are hardly a time most people associate with drug use. But aspects of family, school, and community environments during this crucial window of human development can set the stage for the social, emotional, behavioral and academic problems that, a decade or more later, may take the form of increased risk-taking and experimentation with substances like alcohol, cigarettes, or illicit drugs. Early environments can even shape the developing brain in ways that make an individual more prone to developing substance use disorders. By the time a child reaches adolescence—the period of increased experimentation and onset of drug use—more effort is needed to shift the brain and behavior in a healthy direction. The new Guide describes the principles derived from research designing, implementing, and testing prevention programs aimed at the first 8 years of life (including prenatally) and the supporting data that have been gathered so far on 17 evidence-based prevention programs. Central to intervening early is the idea of shifting the balance of risk and protective factors in a way that builds a foundation for optimal social development and resilience. For example, there is now substantial evidence that when parents are able to provide warmth, a supportive and stable home environment, adequate nutrition, and physical and cognitive stimulation during the early years of a child’s life, their child is more likely to develop strong self-regulation abilities. Emotional and behavioral control can then, during the teen years, translate to greater ability to resist risky impulses and unhealthy forms of peer pressure. Interventions that help caregivers provide a healthy, supportive environment show positive outcomes such as delayed initiation of drug use and reduced adolescent drug use. Although the science is too young to have much data beyond adolescent outcomes, positive benefits of early intervention have been shown to extend in a few cases to young adulthood. Research has also revealed that many early risk factors for substance abuse are also, simultaneously, risk factors for other behavioral and emotional problems. Acting aggressively and disruptively in preschool, for example, relates to increased risk for conduct disorders, substance use, delinquency, and risky sexual behaviors during adolescence. Thus interventions designed to reduce early risk factors show benefits in a wide range of areas—including improved personal and social functioning, better performance in school, and less involvement with the juvenile justice system or mental health services. Like all investments, prevention costs money, but interventions more than pay for themselves in reduced costs later on. Where benefit-cost data for specific interventions are available, they can range from modestly good investments (a few dollars for every dollar invested) to overwhelmingly good investments ($26 for every dollar, in the case of one classroom-centered intervention component, the “Good Behavior Game”). Thus a well-designed, well-implemented early childhood intervention can dramatically benefit the community and society as well as improve children’s and families’ quality of life. This new Guide reflects important new thinking about the roots of substance use and the ways to more effectively avert it. Intervening in the first years of a person’s life can be an effective lever to set kids on a positive course and hopefully reduce the terrible toll associated with drug use and addiction. Thank you so much for this post as it comes at a time when we are about to embark on the first prevention intervention pilot program in my country, Myanmar. Please continue posting articles like this so that we can actually implement them at the grass-roots level. I have founded a local NGO, the Substance Abuse Research Association( SARA), since 1999, after coming back from my NIDA Humphrey year in 1995-96. Thanks again, for your excellent work and untiring efforts in the field of drug abuse. I wonder if she has learned yet that genetics play a far bigger role in addiction causation than is being let on? And while decriminalization/legalization is necessary, it needs to be backed up with public health announcements explaining exactly why it is needed. Its not in any way condoning the abuse of addictors, it is done bc the alternative, the drug war, has made things infinitely worse on almost every level, to include making all drugs abundantly available to any & all that wants them. We need to pull LE out of the drug biz & that will free up a lot of resources currently chasing their collective tails. When the laws create more harm and cause more damage than they prevent, its time to change the laws. The $1 TRILLION so-called war on drugs is a massive big government failure - on nearly every single level. Its way past time to put the cartels & black market drug dealers out of business. Mass incarceration has failed. We need the science of addiction causation to guide prevention, treatment, recovery & public policies. Otherwise, things will inexorably just continue to worsen & no progress will be made. The war on drugs is an apotheosis of the largest & longest war failure in history. It actually exposes our children to more harm & risk and does not protect them whatsoever. In all actuality, the war on drugs is nothing more than an international projection of a domestic psychosis, it is not the "great child protection act," its actually the complete opposite. We need common sense harm reduction approaches desperately. MAT (medication assisted treatment) and HAT (heroin assisted treatment) must be available options. Of course, MJ should not be a sched drug at all. "Prohibition goes beyond the bounds of reason in that it attempts to control a man's appetite by legislation and makes a crime out of things that are not crimes. A prohibition law strikes a blow at the very principles upon which our government was founded." I am the mother of two heroin addicts. Raised in a two parent loving home. Surrounded by extended family with cousins their age. Raised in the church. Active in social and religious missions. Good students praised by teachers with many friends. Educated from pre school about prevention. Genetically pre disposed on maternal and paternal sides. Daughter went from marijuana to heroin in 6 months at age 17. Currently 29 and in prison. Son marijuana at age 17 heroin by age 21. Currently in third rehab. I applaude reserch in addictive sciences. But I agree more vigorously with the respondent who stated criminal justice reform is what's needed. Research in treating this massive epidemic is what is needed. And NOW implementation of the TAX FUNDED RESEARCH nationally! If this NATIONAL EPIDEMIC CONTINUES THERE WONT BE A GENERATION TO RAISE CHILDREN TO IMPLEMENT YOUR THEORY. Loneliness, feeling neglected, unstable environment, etc make a kid disconnected and rude. Sometimes he finds refuge in substance abuse that leads to addiction or alcoholism. Early intervention and support help in leaving addiction and put a check on risky behaviors. NIDA. "Intervening Early to Prevent Substance Use Disorders." National Institute on Drug Abuse, 9 Mar. 2016, https://www.drugabuse.gov/about-nida/noras-blog/2016/03/intervening-early-to-prevent-substance-use-disorders. NIDA. Intervening Early to Prevent Substance Use Disorders. National Institute on Drug Abuse website. https://www.drugabuse.gov/about-nida/noras-blog/2016/03/intervening-early-to-prevent-substance-use-disorders. March 9, 2016.